Just a small swag update today. That’s probably one of the most expensive EarthBounds ever sold. I don’t think the prototype cartridge sold for that much even. There’s some more info here, too. These posters are very rare, I usually see them once every two or three years, and they tend to fetch pretty high prices. From what I’m told, there are actually two different types of EarthBound posters, the biggest difference being their sizes. Does anyone have any more info on the poster differences? I’d like to know more about them, but good, definitive info is hard to find. That’s all for now, if you come across any cool EarthBound/MOTHER-related auctions or whatever, let me know and I’ll probably make an update about it! I’ve never really seen this poster before. Was this after the scratch and sniff contest because, if I’m not mistaken, wasn’t the mystery smell pizza? The answer was right in front of our noses! Pun intended… ? I don’t know if there was a clear cut-off date for the contest. 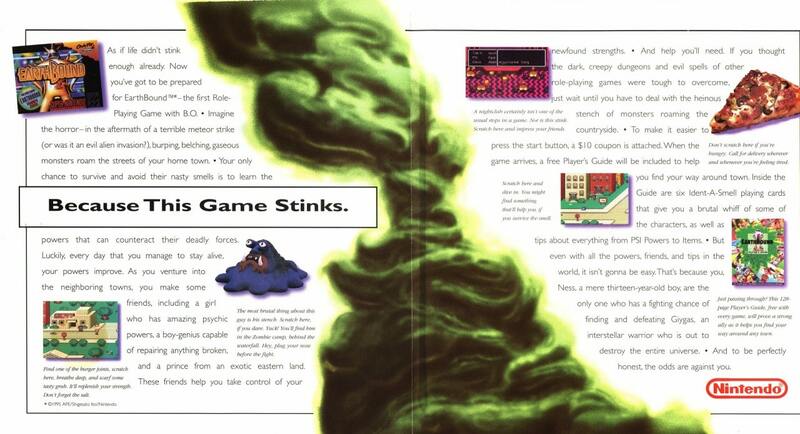 But I assume the posters were in stores before and shortly after the game’s release. Yeah, the pizza smell was a dead GIVEAWAY! Hah! I can make a pun too! I’m trying my hardest to get this poster. Even though I have no clue yet where I’ll put it. Oh, Mato, did you get my email? I used the submit thing on here. I’ve seen that poster before! They had it up over the SNES section at the local video rental store where I grew up. I recall seeing the poster every time I went there and one day finally spotting Ness in the Starman’s visor. Curiously enough I don’t remember them actually having a copy of the game there. 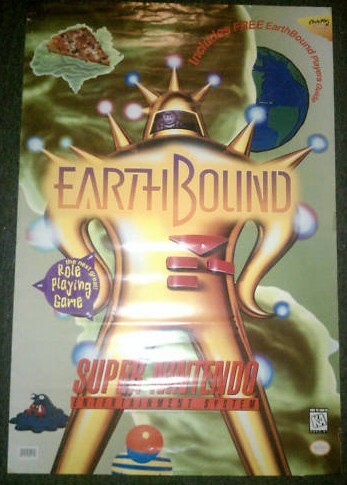 I’d certainly love a good EarthBound poster, but while that is an EarthBound poster, yes, it’s kinda lacking on the “good” bit IMO; it strikes me as being a bit too cluttered and bright, with that… stuff… in the background. So yeah. Still, great to see one appearing and all that. Over $80 with almost 6 days left? This one’s gonna go for several hundred at least. Too bad it’s not sealed in a VGA box, they could sell it for $3000 or so. I just realized. While I was on this site on an iPad, it was all vertical. You could wear earthbound central as a tie!! Wouldn’t that be awesome!? NO game should ever be that much. Maybe a prototype of something…maybe. Wow a copy of earthbound celling for over $1000! I mean sure copys of earthbound can get pretty expensive but come on! All right, who killed my chance at winning this thing? Congrats, neonix! Display that bad boy with pride. You’ll pay over $360, to be more exact. Congrats, I guess. At least it’s in good hands. I hate how people sell Earthbound at ridiculously high prices because they think its rare when its not, otherwise it wouldn’t constantly pop up.